I’ve been pleased with the quality of the GoPro and have been replaying my lessons at home to revise what I’ve learnt in the air (and to identify any mistakes or things to do better next time). My biggest disapointment has been the battery only lasts around 1 hour 10 minutes fully charged, which isn’t enough time to capture the entire lesson. Extra GoPro rechargeable batteries – at only £20, one of the cheapest options. However it involves physically swapping the batteries over, something which I don’t want to be distracted with mid-flight. GoPro BacPac – at £50, this pricey option connects directly to the back of the GoPro and provides another battery (without needing to swap anything over). The website doesn’t say how much extra time/power this provides. I didn’t choose this option because when attached to the GoPro the GoPro is too big to fit within the cover, meaning I’d need to also buy new mounting kit. Veho pebble 5000mAh portable battery’ – inspired by the setup used by the excellent GoProFlying, I was tempted to buy this £30 external USB battery pack. It provides nearly 5 times more power than the built-in GoPro battery, so should keep filming for around 6 hours. I decided against this option in the end because of its size and weight. I’m currently mounting my GoPro using the suction cup mount, and this would need to be fixed somewhere nearby – complicating the mounting setup. Anker Astro Mini 3000mAh Ultra-Compact Portable Lipstick-Sized External Battery Charger – I picked this up for only £10 from Amazon. I settled on this solution because of it’s tiny size and light weight. It’s slightly larger than a lipstick and is light enough to leave connected & dangling without danger of it pulling down the suction cup mount. So far, so good. I filmed two lessons in a row and the GoPro was still fully charged, and the Anker still had charge left. 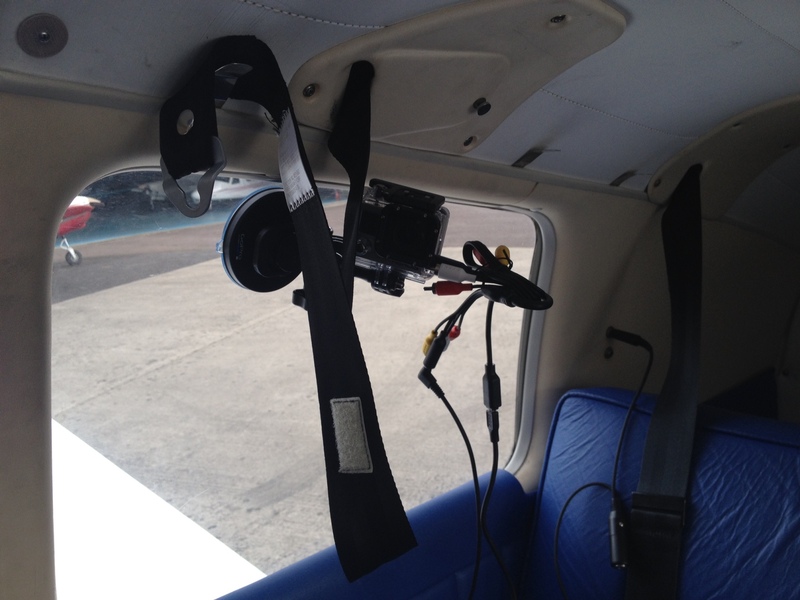 It was fine dangling from the GoPro and didn’t cause any problems with the suction cup mount. The Anker is dangling down out of sight – you can see the USB cable. The other cable dangling down is the audio connector going in to the plane’s rear headphone socket. hello. did you used external microphone ? did it not interfere with the battery and output a bad sound ? The GoPro is connected directly to the cockpit audio using the GoPro 3.5mm adaptor. It works perfectly with no interference. I’ve been thinking of buying a similar setup but am confused as to how you connect both the battery pack and the mic adapter into the USB socket. The GoPro HERO only has one USB socket as far as I can tell, so if you use that for the external power, how do you also connect the mic adapter. Am I missing an adapter, are their two USB ports on the GoPro, or can you daisy-chain the USB devices? You’re right. The GoPro only has one USB connection. 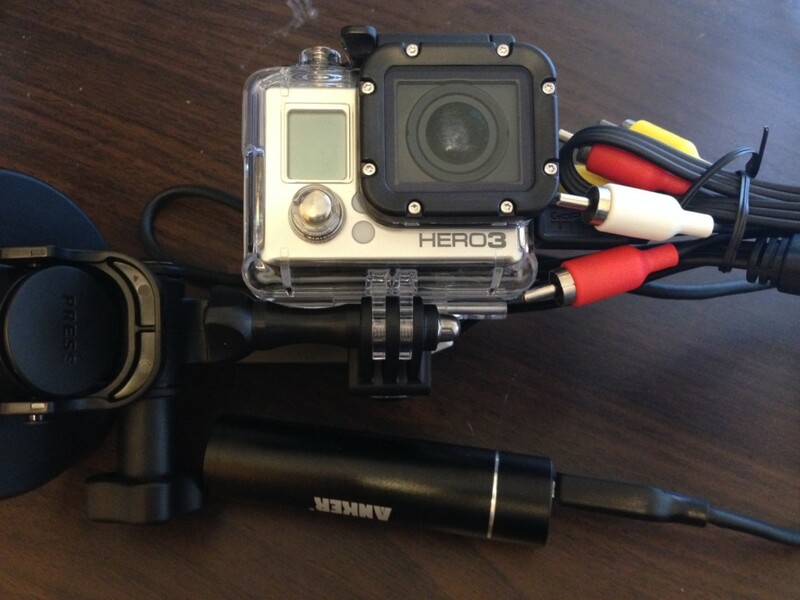 To connect the audio adaptor and the USB battery at once, you need to buy the GoPro Combo Cable – approx £32. It connects to the GoPro using USB, but it gives you an additional USB connector and a 3.5mm audio jack. It also gives you composite video out, which I haven’t used.